AN NCTE-INTEL ® Teach – GNDU Collaboration for organizing Workshops on ICT integration in Teacher Education for sustaining professional growth among teachereducators. 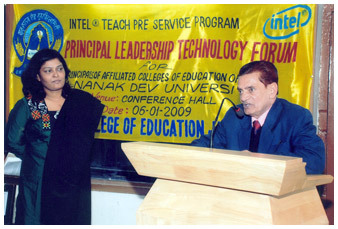 Guru Nanak Dev University is the first University of Punjab to collaborate with Intel ® Teach and NCTE to provide sustained professional growth of teacher educators working in colleges of education affiliated to G.N.D.University striving to become a leading centre of academic excellence by expanding the frontiers. Dr Amit Kauts Principal, MGN College of Education, Jalandhar and Dean, Faculty of Education, G.N.D.University told that to provide this training all the teacher educators will be provided 50 hours professional training for ICT integration in teacher education. For achieving this objective, two teacher educators from each college of education are provided training for becoming master trainers and rest of the teacher educators will get training by these master trainers. For training master trainers, teacher educators were categorized into four groups each consisting of 25 teacher educators. Two groups are trained in M.G.N. College of Education from 6th – 11thJanuary 2009 and 4th – 9th February 2009. Other two groups are trained at D.A.V. College of Education, Amritsar and Khalsa College of Education, Amritsar from 7thJanuary – 12 January 2009. This programme was inaugurated by Prof (Dr) Jai Rup Singh, Vice Chancellor, G.N.D.University, at M.G.N. 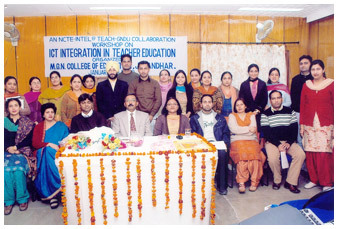 College of Education, Jalandhar on 6th January, 2009. In his presidential remarks Prof (Dr) Jai Rup Singh stressed that quality education in B.Ed. colleges is much more required because these institutions have to prepare the teachers who have to teach the future generation in our schools. If the child has repulsion of going before teacher then society will be in the hands of war. So we must have good, dedicated and sincere teachers even equipped with information, communication and technology. He congratulated the Management, Principal and staff to organize such a workshop. S.Jarnail Singh Pasricha, Hony.Secretary, MGN Educational Trust, former Deans of Faculty of Education and approximately 40 Principals of different colleges of education alongwith team of Intel Teach Programme. Mr.Vinay Mehra, Pre Service Programme Manager INTEL Teach Programme and Mrs.Pragya Sinha, Programme Manager for NCTE Programme and the trainers were present among other dignitaries. After the inaugural session, there was 3 hours Principal Leadership Programme and all the 40 Principals attended this programme. Among the Principals who attended this workshop were Dr J.S.Dhillon, Dr Aruna Anand, Dr Amit Kauts, Dr Suruchi Rishi, Dr Soni Nanda, Dr Shangara Singh, Mrs.Uttamjit Kaur, Dr Dev Ichha, Dr Jyoti Sidana, Dr Kanchan Kohli, Dr Mona Vij, S.Nanak Singh, Dr H.S.Birdi, Dr.D.K.Joshi, Dr Sarabjit Kaur, Dr S.M.Gupta, Dr Anita Verma, Dr Alka Gupta, Dr Ruby Vashisht, Dr Jaspal Singh, Dr Geeta Verma, Dr Rupinderjit Kaur, Dr Satinder Gill, Dr Pritpal Kaur, Dr B.M.Sharma. Mrs.Praghya Sinha Assistant Manager, Project NCTE conducted the Principal Leadership Forum Programme. She provided group activities and inter active sessions for realizing out such skills which Principals must possess to handle various kinds of situations in the College. This was followed by training of teacher educators as master trainers, conducted by Mr.Dharmesh Acharya. 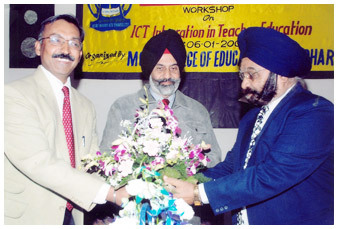 In continuation with this NCTE-INTEL ® Teach Programme, the other workshops for training teacher Educators were inaugurated on January 7, 2009 at Khalsa College of Education, Amritsar under the supervision of Dr J.S.Dhillon and D.A.V. College of Education, Amritsar under the supervision Dr Aruna Anand which were inaugurated by Dr S.S.Chahal, Director, Research, G.N.D.University, Amritsar and attended by Dr Amit Kauts (Dean, Faculty of Education). The training programme was conducted by Mr.Samer Rathore at Khalsa College of Education, Amritsar and Mr.Sapna Bisht at D.A.V. 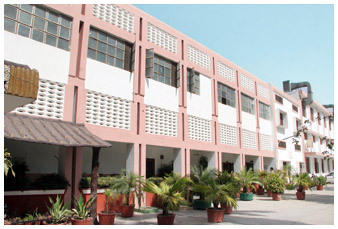 College of Education, Amritsar. 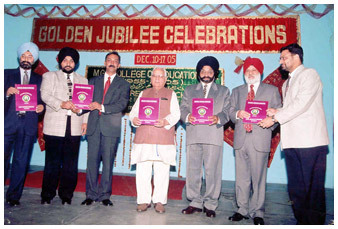 Lastly, the Fourth Batch was inaugurated at MGN College of Education, from 3rd -8thFebruary, 2009 was inaugurated by Dr Amit Kauts, Dean Faculty of Education, Amritsar. 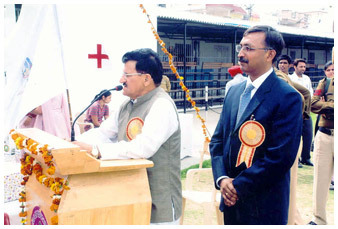 The conclusion of the programme was presided over by Dr S.S Chahal, Director Research, GNDU Amritsar on 8th Februray, 2009. Through this programme approximately 85 Teacher Educators were trained through this programme. Further these Teacher Educators are directed to train Teacher Educators of their respective colleges. They are supposed to send a copy of training schedule, a completion certificate from the college Principal along with one digital portfolio of the each teacher trained during the programme in their respective colleges. This will make them eligible to become Master trainers and the Teachers Educators trained will get Certificate of Participation. In the training workshops, participants are extensively trained in advanced features of PowerPoint, lesson plans integrated with teacher presentations & student presentations, preparation of blogs for student support facilities and publication features etc. Intel ® Teach program is world wide initiative to help both in-service and Pre-service teachers integrate technology into the classroom to enhance student learning. The pre-service programme is an important segment of the Intel Teach program. It enables Teacher Educators to discover how to use technology to promote enquiry based learning to research, communication and productive tools. Intel Teach Program is currently associated with 60 Universities across the country.